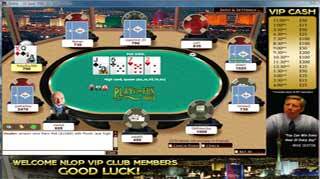 Playing real poker online with other players from around the world is fun and exciting with our new software. Our cardroom is open 24 hours a day, 7 days a week. 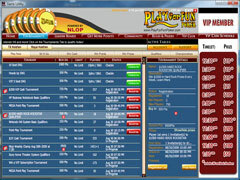 In the images below you will see that our expert design team has done everything possible to make your poker playing experience realistic and enjoyable while playing at Play4FunPoker.com. This is the lobby screen. From here you can see the summaries of all the active poker games including the players that are sitting at each table. From the lobby you can go to a table, join the wait list or go to your account tools to manage your account. All the features of the lobby are available through a friendly, point and click interface. This image shows a sample game table. The labels on each of the seats clearly indicate where players are seated. Each time a player acts the action is clearly displayed on the label. All community cards are located at the center of the table and are never covered by chips or other items. A small round dealer button is used to indicate which player is currently the dealer. All cards are dealt from the player who has the dealer button. The action buttons and options are placed in the ideal locations to ensure the software is easy and fun to use. Click Here to download now and get into the action!